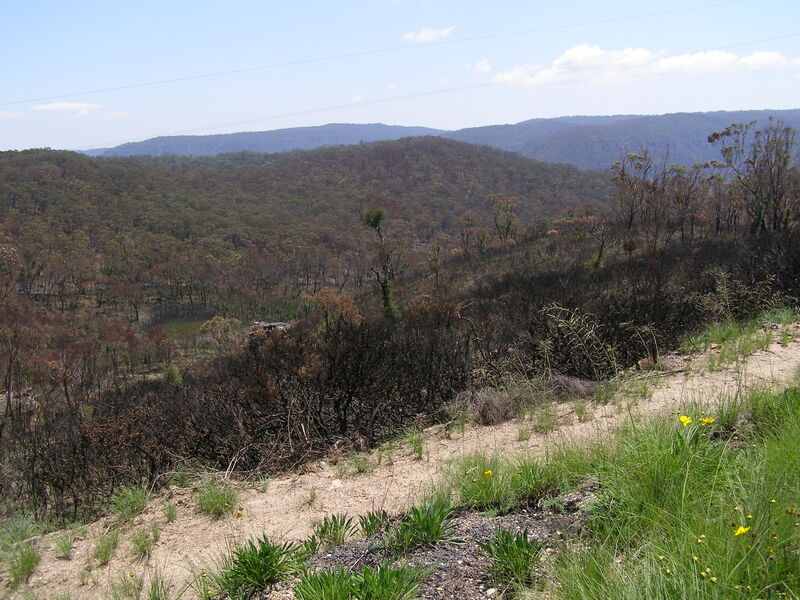 In November 2006, two separate bushfires that were allowed to burn out of control for a week as well extensive deliberate backburning, ended up causing some 14,070 hectares of the Blue Mountains National Park to be burnt. This wiped out a significant area of the Grose Valley and burnt through the iconic Blue Gum Forest in the upper Blue Mountains of the Greater Blue Mountains World Heritage Area (GBMWHA). In the mind of Rural Fire Service (RFS) and the National Parks and Wildlife Service of New South Wales (NPWS), National Parks and World Heritage do not figure as a natural asset worth protecting from bushfire, but rather as an expendable liability, a ‘fuel’ hazard, when it comes to bushfire fighting. This massive firestorm has since been branded the ‘Grose Valley Fires of 2006‘. About a month after the fire, on Tuesday 19th December 2006 there was apparently an ‘Inter-Agency Review‘ which took place at Katoomba behind closed doors by members of bushfire management and operating personnel involved in the fire fighting. Despite requests by this Editor, no minutes or reports of that meeting were ever forthcoming. The meeting was internal and secret. Immediate local community outrage called for explanations and accountability from the Rural Fire Service (RFS) (the government agency responsible for rural fire fighting throughout the State of New South Wales) in charge of fighting the bushfires and for a review of bushfire management practices with a view to ensuring that the highly valued Greater Blue Mountains World Heritage Area and iconic Blue Gum Forest in particular is protected from bushfire in future. Many members of the local community called for an independent and public review or enquiry. ‘To start, this is directed at the upper levels of the RFS and not to the wonderful local volunteers – many of whom are loved and respected friends and colleagues. To stop the loud community Chinese whispers and restore faith with the local community, could someone please respond with factual answers about the recent Grose Valley fire that are not reinterpreted with a political spin. How many hectares of bush was burnt by the Grose Valley wildfire and how many was burnt by the RFS mitigation efforts? How many houses and lives were at risk from the wildfire as versus to the RFS fire? How many millions of dollars were spent on water bombing the RFS fire? How many litres of precious water were used to put out the RFS fire? 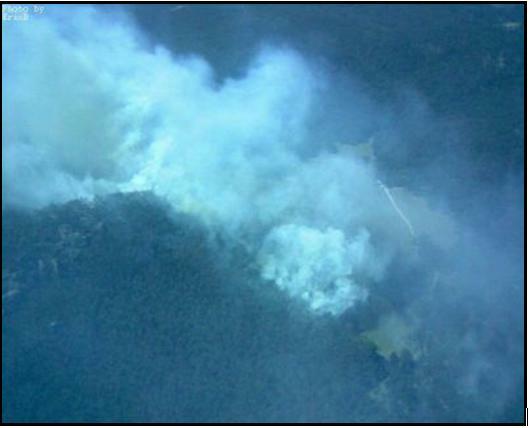 Is it true that soil-holding rainforest was burnt and that the real reason for the Mt Tomah road block was erosion from the RFS removal of this natural fire-break? Was local advice and expertise sought and followed or simply ignored? If mistakes were made, what measures will be taken to ensure that this does not happen again? Ed: Her questions were never answered. With the RFS rejecting calls for a public or independent review, there was a general sense amongst many in the local community of a cover up and of gross incompetence going unaccounted for. A week later, a front page article was published in the Sydney Morning Herald 20061211 by journalist Gregg Borschmann entitled ‘The ghosts of an enchanted forest demand answers‘ ^http://www.smh.com.au/news/national/the-ghosts-of-an-enchanted-forest-demand-answers/2006/12/10/1165685553891.html [>Read article]. A second in depth article by Borschmann was also run on page 10 ‘The burning question‘, ^http://www.smh.com.au/news/national/the-burning-question/2006/12/10/1165685553945.html?page=fullpage#contentSwap1, [>Read article – scroll down]. Were fire detection and initial suppression timely and adequate? Were resources adequate, appropriate and supported? Were the adopted strategies the best available under the circumstances? Could other strategies of closer containment have offered lower risk to the community, better firefighter safety, higher probabilities of success, lower costs and less impact on the environment? Was existing knowledge and planning adequately utilised? Is fire management funded in the most effective way? 2. Ensure adequate funding is available for post-fire restoration, including the rehabilitation of environmental damage. 3. Pay for more research to improve understanding of fire in the Blue Mountains landscape and methods for fire mitigation and suppression. 4. 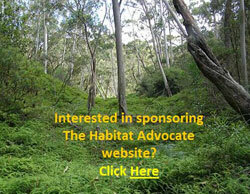 Improve training in strategies for controlling fires in large bushland areas. 5. Improve pre-fire planning to support decision-making during incidents. Ed: The above community questions and demands were ignored by the RFS and the New South Wales Government. 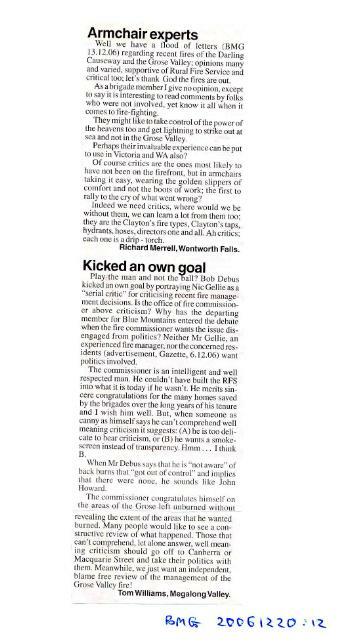 Many within the ranks of the RFS came to its defence, as the following letters to the Blue Mountains Gazette reveal. 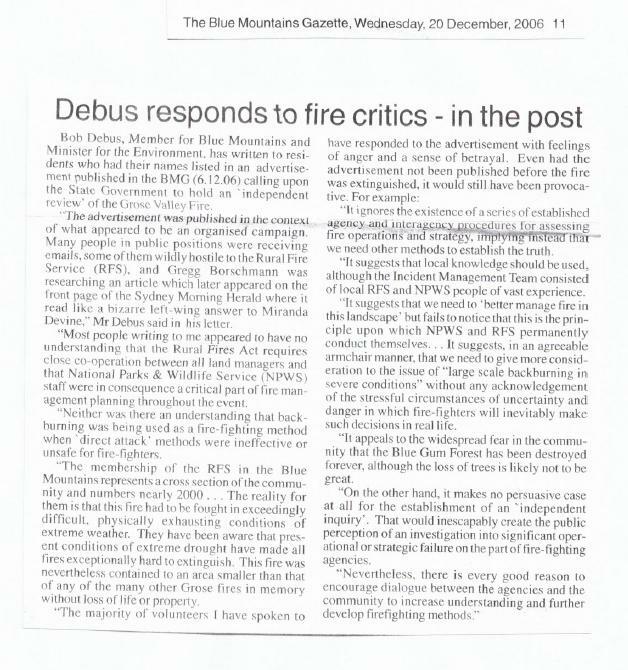 As letters to the editor continued over the Christmas holiday break, by January 2007, Local Member for the Blue Mountains and Minister for the Environment, Bob Debus MP finally responded by proposing that community members be given an opportunity to discuss their concerns with fire authorities and be encouraged to contribute to the development of revised fire management strategies, policies and procedures which may arise from the routine internal reviews of the 2006-07 fire season, and particularly the Grose Valley fire. The ‘Grose Valley Fire Forum‘ was scheduled for Saturday 17th February 2007, but it was invitation only. I requested permission to attend, but by was rejected. 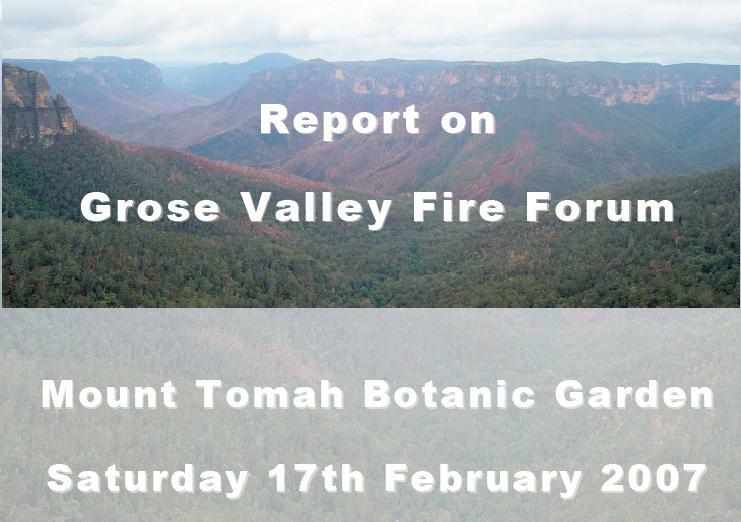 The following is an edited account of the official ‘Report on (the) Grose Valley Fire Forum‘, which was arranged and co-ordinated by the Blue Mountains World Heritage Institute (BMWHI) and which took place at Blue Mountains Botanic Garden, Mount Tomah on Saturday 17th February 2007. The Report is dated 16 March 2007. ‘The content of this report reflects the Forum discussion and outcomes and does not necessarily reflect the views of the Blue Mountains World Heritage Institute‘ – BMWHI. The Grose Valley Fire Forum and report were undertaken by the Blue Mountains World Heritage Institute at the request of the NSW Minister for the Environment, the Honourable Bob Debus MP. Ed: Assuming that the forum concluded at around 5pm, the duration allocated for discussing and devising the ‘Actions’, including each Action’s Goal, Trends, Causes and Conditions, Delegation and Timeframe was just 3 hours, presuming the forum ended at 5pm. Since there are and remain some 50 listed Actions out of this forum within a 3 hour allocated period (2pm to 5pm), just 3.6 minutes was allowed for discussing and devising the details of each Action. It is highly implausible that this could have been completed at the forum. So the question remains: were many of the Forum’s 50 Actions in fact devised outside the forum either by the Blue Mountains World Heritage Institute on its own or in consultation with some of the forum attendees? In any case none of the Actions has been undertaken. There has been no follow up report on the performance of the Actions. This Grose Valley Forum of 2007 was just a politically contrived token talk-fest behind closed doors. Its glossy motherhood report was designed to appease critics of the RFS management of this devastating fire. The forum was not open to the general public, nor was it independent of bushfire management’s selective bias. The only benefit was that bushfire management would appease the critics of its handling of the fire fighting by producing a report and that most would forget. Well the purpose of this article is, out of respect for the ecology and wildlife of the Grose Valley, to reveal that report and to help ensure people do not forget. 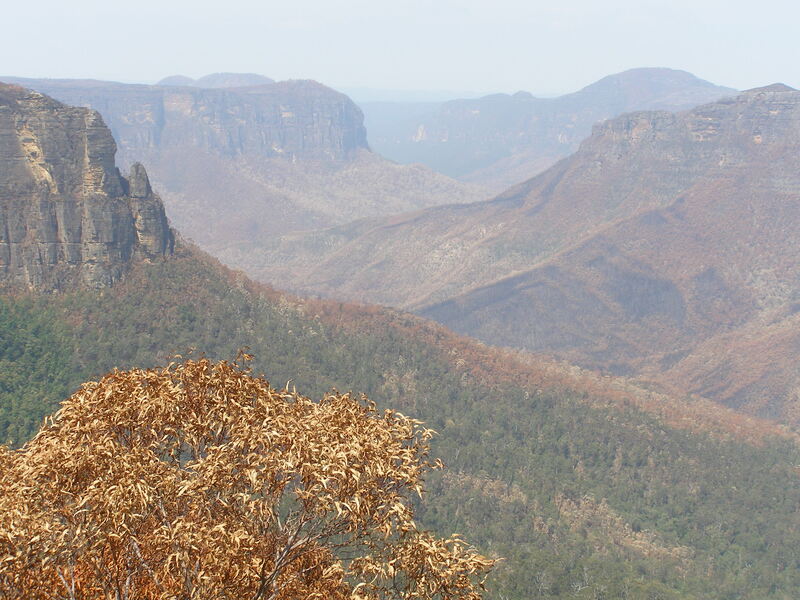 In November 2006, fire caused by lightning strikes burnt a significant area of the Grose Valley in the upper Blue Mountains of the Greater Blue Mountains World Heritage Area (GBMWHA). Like many areas throughout the GBMWHA, the Grose Valley is an area of high natural and cultural value, including the iconic Blue Gum Forest. The two original ignitions were designated as the Burrakorain Fire and the Lawson’s Long Alley Fire, and they came jointly under the jurisdiction of an emergency declaration under Section 44 of the Rural Fires Act. and to develop management systems to better capture and utilise local knowledge. contribute to, the development of future research projects concerning climate change and fire regimes. The Minister invited the Blue Mountains World Heritage Institute (BMWHI) to organise and chair a forum of representative community members and fire authorities. The Institute is an independent non-profit organisation that supports the conservation of the natural and cultural heritage of the GBMWHA, with a key objective to “support the integration of science, management and policy within and adjoining the GBMWHA properties. Develop an action plan, which responds to any unresolved issues identified above. In addition to senior representatives of the agencies involved, representatives also came from the principal community-based organisations that had expressed concern and called for a review process. It should be noted that one of the main public calls for a review was made by an informal coalition of residents that was not formally represented at the forum, but a number of these residents were members of those organisations represented. An open invitation was given to the community organisations to identify the issues of community interest and concern to be discussed at the Forum. From these issues, a consolidated list of 22 issues (Table 1.2) was prepared by the Institute, and then circulated to all participants prior to the forum. To facilitate the workshop discussions and the detailed consideration of the identified issues, the ‘5R Risk Management Framework‘ was used to group the issues. Following a Gundungurra and Darug ‘Welcome to Country’ by Carol Cooper, and an introduction by the Forum Chair, self-introductions and personal opening statements were made by each participant without comment. These were followed by a series of briefins on management of the Grose Valley Fire and fire management generally within the World Heritage Area. The Forum began by acknowledging that fire management in the Blue Mountains is close to best practice in many ways. It was unfortunate that copies of the Section 44 debrief report were not available for the forum as anticipated (Ed: a copy is provided in the ‘Further Reading‘ appendix below). While this was partly overcome through verbal presentation and comment, it limited the ability to reach consensus on the factual basis of what happened on the fire ground and to move forward productively from this point of consensus. Community representatives expressed their dissatisfaction with this situation, and it must be noted that the forum was therefore not able to engage effectively on specific issues of the control strategies used on the Grose Valley Fires. After a brief session on points of clarification, the issues presented to the forum were explored in detail by working through a problem orientation process that asked a series of questions about each issue, to reach consensus on the exact nature of the problem. As this work progressed, a series of agreed actions were identified to effectively address key aspects of the issues as these unfolded. It is noted that the issues addressed toward the end of the day were examined in less detail due to time constraints, but warrant further attention (e.g. the issue about remote area fire-fighting teams). The original list of 22 issues was consolidated into 11 goal statements, with 50 associated actions. The main body of this report presents the goals and actions along with documentation of the discussion that took place on the day. It utilises the structured approach to systematically work through the issues, and identify the actions required to bring about more sustainable bushfire management for the Blue Mountains. Within a week of the Forum, the Institute circulated a copy of the forum proceedings to all participants for comment and clarification. The Institute also sought identification of responsibilities for the 50 Actions identified by the Fire Forum. A big challenge in bushfire management is how to better integrate valid community interests with those of fire management agencies. Over recent years, the public has come to demand and expect a greater say in decision-making processes that impact upon their local environment. The Grose Valley Fire Forum represents a step forward in this process of better integrating community knowledge and interests into local natural resource management. The Forum also illustrated that the Blue Mountains community is both a great supporter of fire authorities, and of the role of volunteer firefighters for the outstanding effort that they are prepared to undertake on behalf of the community. How well are plans being implemented and what are the barriers to implementation e.g. financial, institutional, political? How should fire authorities and land managers respond to climate change impacts? How can bushfire management policy allow for the incomplete knowledge of complex ecological systems? What roles should science and other research play in decision processes, given the uncertainty arising from incomplete understanding of ecosystem dynamics and insufficient scientific information? How do we resolve the conflict between rapid fire suppression to reduce risk versus the fire-dependency of the ecosystem? What does it take to more effectively mitigate against the risk? 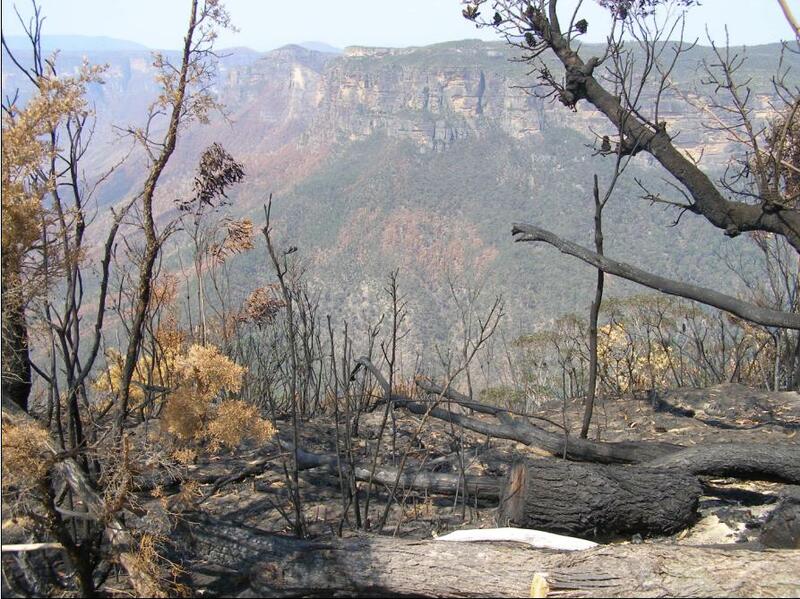 Concern that fire control strategies do not compromise the significant natural and cultural heritage values of the Greater Blue Mountains region. 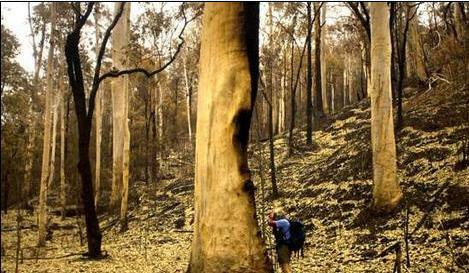 How can bushfire management policy better account for protection of World Heritage values? How adaptive is bushfire management and policy to the specific circumstances of the Blue Mountains? Modelling the effects of different control strategies and suppression. The Forum acknowledged the increasing and serious challenges arising from risks associated with liabilities and litigation. These trends are of principal concern to fire management agencies and the fire fighters themselves, and many in the general community share these concerns. The complexity is increasing, especially with climate change, along with pressure for bushfire management to be more adaptive and responsive to the needs of the present and the future. analysis. The system should be able to support open reflection after a fire, without blame or litigation. This is where a process of scientific analysis should come into its own: what the fire did, what was done to control it, what worked, what didn’t, why or why not, and what can be done to make things better. How can the system be changed and improved to make success more likely? raised the Grose Valley fire and resulting Fire Forum. To overcome the key problems identified by the Grose Valley Fire Forum and achieve real and lasting triple bottom line outcomes, change and innovation need to take place in the realm of governance. This is particularly the case in the areas of science, policy and decision-making. The Grose Valley Fire Forum has brought fire management agencies and interested representatives of the community together in a spirit of co-operation to consider issues critical to the management of bushfires. Driven by the high conservation values of the Greater Blue Mountains World Heritage Area, the implications of the issues raised at this Forum have obvious relevance to other regions and states. Protecting people as well as the environment should not be mutually exclusive. Our efforts to address this challenge in the Blue Mountains will increasingly come in for close scrutiny. Notwithstanding the existing mechanisms of review and community consultation surrounding bushfire management, the Institute recommends to the Minister that the issues and actions identified herein by the Grose Valley Fire Forum warrant special consideration and support. Properly pursued with senior political and agency commitment and support, they offer key insights and potential pathways for the continued adaptive development and implementation of state of the art fire fighting for which NSW, and in particular, the Blue Mountains are justifiably renowned. 1. Commitment in fire management to conservation of natural and cultural values of World Heritage Area as well as human life and property. 2. Understanding and consideration (including on-ground knowledge) both by those involved in pre-fire planning and those required to make operational decisions during fire events -of the WH values for which the GBMWHA was inscribed on the world heritage list, and of other values, such as geodiversity, cultural values and beauty, which have the potential to be nominated for World Heritage listing in the future. 3. Biodiversity impacts of frequent fires in Grose Valley for last 40 years, including impacts of the recent fire on World Heritage values. 4. The ecological basis for fire policy (knowledge base for response of local biota to fire regimes) e.g. biodiversity loss associated both with high fire frequency and intensity, and with fire exclusion. 5. 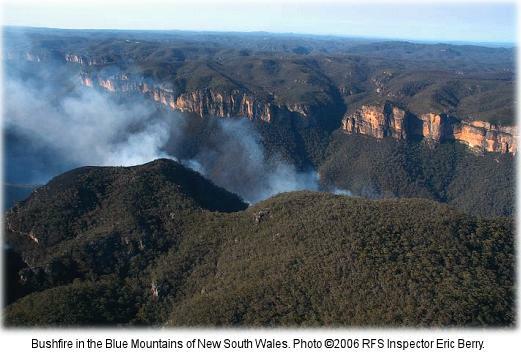 Translation of NPWS Blue Mountains Fire Management Plan (e.g. risks to natural heritage particularly World Heritage values) to S.52 operational plans during Grose Valley fire. 6. Effectiveness of review processes in generating real improvements for the future; current debriefing process performed by BFMCs [i.e. BFCC Policy 2/2006]. 7. Assessment of community values – protection of property versus protection of the natural environment. 8. Implications of climate change for increased fire frequency and intensity. 9. Adequate funds for fire suppression versus inadequate funds for research, planning and fire mitigation. 10. Effectiveness of current risk strategies in managing fire regimes for biodiversity and community/asset protection (e.g. upper Grose Valley). 11. Implications of climate change for risk modification (e.g. fuel reduction). 12. Skills in implementing fire control strategies for large bushland areas e.g. back-burning. 13. Ecological sustainability of current responses to fire (both suppression & bushfire risk management) e.g. knowledge and skill of plant operators in sensitive environments (environmental damage from machine work e.g. bulldozer lines). 14. Community understanding of control strategies used. 15. RAFT capacity (e.g. for night-time work). 16. Efficiency of fire detection technologies. 17. Back-burn control strategy from “Northern Strategic Line” and Bell’s Line of Road in large bushland area: overriding consideration for asset protection versus lack of consideration and recognition of impacts on ecological values. 18. Application of planning, guidelines, procedures & local information & expertise during fire suppression. 19. Rapid containment of lightning strike or arson fires. 20. Aerial attack efficiency and effectiveness. 21. Media – inaccurate and misleading use of language and presentation of information. 22. Funding for post-fire assessment, strategy review and ecological restoration including addressing activation of weed seed banks. What goals or ends do we want? Looking back at the history of the issue, what are the key trends? Have events moved toward or away from the specified goals? Describe both past and current trends. What factors, relationships, and conditions created these trends, including the complex interplay of factors that affected prior decisions? (e.g. environmental, social, political factors) i.e. what explanations are there for the trends? What management activities have affected the trends? What are the conflicts about different approaches to address the issue? Based on trends and conditions, what is likely to happen in the future (e.g. if nothing is done differently). If past trends continue, what can we expect? Is the likely future the one that will achieve the goals? What future possible developments are there (e.g. politically, environmentally e.g. how will climate change affect the problem)? If trends are not moving toward the goal, then a problem exists and actions need to be considered. What other policies, institutional structures, and procedures might move toward the goal? What research, analysis, or public education may be needed? * Adapted from Clark, T.W. 2002. “The Policy Process: a practical guide for natural resource professionals.” Yale University Press. U.S.
• ensure that these natural and cultural heritage guidelines for fire management are integrated throughout the entire planning framework for short, medium and long-term bushfire management and operational strategies. 8. Review risk management and operational plans to include relevant reserve fire management plan information, including aspects of mitigation and appropriate fire management guidelines from the RFS Environmental Code [BFMC]. 11. Develop a quantitative framework for risk management: undertake research to evaluate the effectiveness of current strategies to inform the resources and strategies required to achieve integrated life, property, cultural and natural value protection outcomes. The research should identify what is the return on current ‘investment’ and the results then linked back to budgeting systems [BMWHI]. 12. Undertake and improve community liaison and surveys to better capture community values within fire management plans [BFMC]. (2?) To better understand the role of fire as an ecological process, including the long-term ecological effects of fire regimes on fauna and flora, as a basis for identifying fire regimes that sustain the ecology both locally and across the landscape. 13. Undertake a research project using the Grose Valley fire as a case study, to ascertain and explore the opportunities to improve fire management for protection of ecological impacts [NPWS, BMCC, CERMB, BMWHI]. 16. Source external funds for priority research and investigation projects [NPWS, RFS, BMCC]. 17. Undertake ecological research into the impacts of fire regimes including intervals between fires, ensuring an appropriate focus on large-scale transformation [NPWS, BMCC, CERMB, BMWHI]. Enabling greater community participation in major fire debriefs and fire reviews. To prepare for the more extreme conditions associated with climate change, by addressing the policy and management implications for control strategies and landscape management. Climate change impacts on hanging swamps. Build understanding of underlying shifts in environmental conditions and their effects on fire occurrence and fire behaviour. Increase the availability of resources for fire-related research, planning and fire mitigation. Ensuring that fire fighters in wilderness and other remote areas have adequate support and training for safe and effective implementation of fire control strategies. To improve RAFT (Remote Area Firefigfting Team) capacity to deal effectively with most remote ignitions. 39. Review and combine NPWS and RFS RAFT policy and procedures, including consideration for nighttime RAFT deployment [NPWS, RFS]. 40. Address pre-deployment capacity in context of return on investment i.e. economically model across landscape to see how it meets needs and model against suppression costs [NPWS, RFS]. To explore the potential of emerging technologies for higher efficiency in fire detection. Continue to optimise effectiveness of aerial attack strategies and operations. To have better processes in place to ensure accurate presentation of fire incident information through the media. To adequately fund ecological restoration after a large wildfire. None of these 50 Actions has been acted upon nor implemented since 2007; now five years ago. The entire forum process was a farce from the outset. It only served to allow those responsible to escape accountability and responsibility for incompetence and mass bush arson without reputational blemish. RFS Incident Controller, Mal Cronstedt, relocated himself back to West Australia (Fire & Emergency Services Authority), where he was from. NPWS Blue Mountains Manager, Richard Kindswood, went on extended leave. RFS Commissioner, Phil Koperberg, was seconded by the NSW Labor Party to become Minister for Blue Mountains (i.e. promoted). Bob Debus was seconded by the Federal Labor Party to become Federal Member for Macquarie (i.e. promoted). Blue Mountains Councillor Chris van der Kley stayed on as Chair of the Blue Mountains Bushfire Management Committee. Blue Mountains Bushfire Fighting practice, strategy, management, culture remains ‘RFS Business-as-usual’ status and similarly ill-equipped for the next bushfire catastrophe. No lessons were learnt. More tragically, no lessons want to be learnt. RFS: …’we know what we are doing and how dare anyone criticise us and our hard working bushfire fighting volunteers! ..as a small ignition ten days prior. ‘Everyone has been to the lookouts. Many have been to the Blue Gum Forest, deep in the valley – but few know the remote and hiden recesses of the labyrinth beyond. Here, an hour or two from Sydney, is a very wild place. The Grose has escaped development. There have been schemes for roads, railways, dams, mines and forestry (Ed: ‘logging’), but the bulldozers have been kept out. Instead, the valley became the ‘Cradle of Conservation’ in New South Wales when it was reserved from sale in 1875 – an event magnificently reinforced in 1931 when a group of bushwalkers were moved to save Blue Gum Forest from the axe. 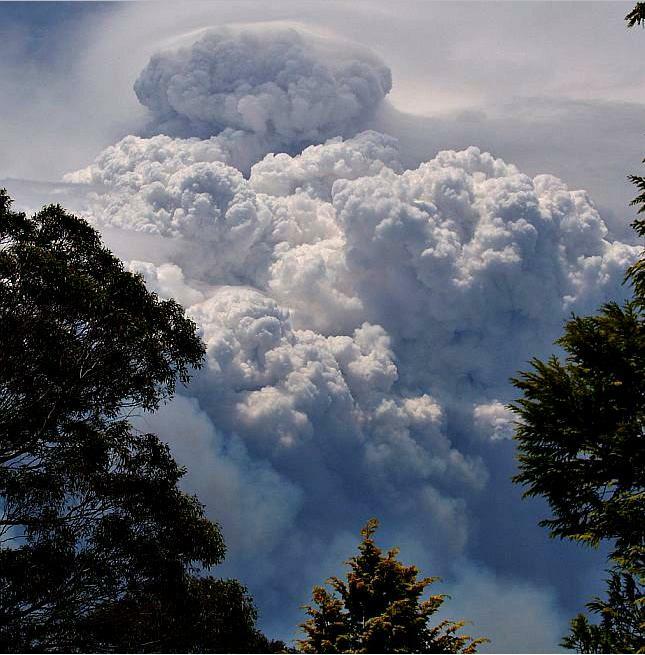 This entry was posted on Friday, March 16th, 2012	and is filed under Blue Mountains (AU), Threats from Bushfire.